The purpose of this blog is to document game systems and insights into the balancing of games as I encounter them in games. I hope that writing about these things will not only improve my own design skills, but also help others out there to. I want to learn from the mistakes of others and want to look behind the scenes why certain things work and how. Raph Koster has written an amazing article on his blog about that. In this piece I will focus on small design decisions that have a great leverage on the dynamics and emotions of the game. Even as a designer the first perception of a game is the own experience. The challenge then is to identify the underlying layers of that experience. Ultimately we will reach the deepest layer of a game; its rules. The fascination of understanding the relations between the rules and the experience they create is what kept me going while analyzing Halfway. Disclaimer: I am not associated with the developers of "Halfway", everything stated here is purely based on my observation and publicity available data. Why Halfway? Actually there is no special reason. I bought the game, I played it. I noticed a few things, wrote them down in my notebook and suddenly realized that I had few interesting things on my hand which came quite close to my goal of unveiling how the mechanics inform the game experience. "XCom: Enemy Unknown" as the best in its class will serve as a reference where needed. Not as a benchmark – it is not about what game is “better”. This piece will be about how slight modifications of the rules lead to completely different game play (which is way more interesting than merely discussing what game is more “fun”). Let’s start. Themes exist outside of genres, outside of graphics styles and outside of stories. From my point of view Half-ways Theme is “Surviving in an environment depleted of resources”. The survival based theme mostly emerges through scarce resources. 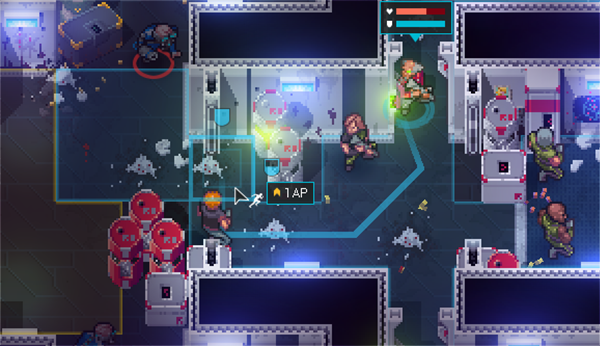 Players constantly have to consider their ammo and health at all times. But creating a deep survival-game-experience is not simply achieved by limiting resources. Many of “Halfways” mechanics are designed to reinforce the survival-theme of the game. Also the story of an “out of control-AI that is hostile towards the player” further reinforces the theme by adding a component of immediacy. These 2 phases are the main tool for controlling the pacing of the game. The exploration phases are the intermissions for the stressful encounter phases. Unfortunately the games has no mechanic to control the pacing WITHIN one encounter. As soon as the combat phase starts, all enemies involved in the fight will spawn and from that point it is up to the player to meet the challenge. 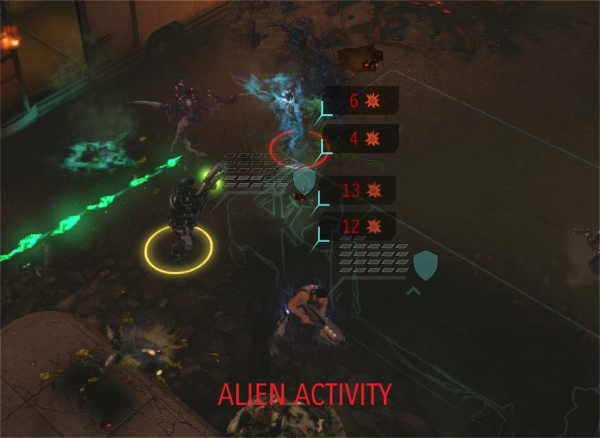 In XCom for example, the levels are also divided into encounters (single enemy groups), but those are much smaller and the player can concentrate on fighting 3 enemies at a time (usually). Whereas in Halfway the enemy groups are much bigger in each encounter (the reasons for that will be covered later). Depending on enemy selection and number of enemies the encounters can be tweaked to match the desired stress-level. Levels also contain some loot crates where the player can find consumable items. Players can find ammo-clips in levels or purchase it. Each ammo clip fills the magazine of a weapon no matter how many bullets that weapon can hold. In Combat; When all loaded bullets of a weapon have been fired, the player needs to reload. Reloading costs 1 AP and 1 Ammo clip. This mechanic alone, creates interesting choices that support the survival theme. In fights players have some control over their ammo usage, while using more ammo is usually the more safe decision within one encounter, but not the best other the long run because every bullet used, is one that the player might be missing in the next encounter – or level. To use ammo efficiently the player needs to carefully choose which weapon to bring to a fight. The weapon choices are influenced by the squad-members using them (they have some unique abilities & properties that determine their role). This is how the ammo system is entangled with all the other systems in the game to deliver the survival-theme. When creating levels and encounters, the designers always need to account for the impact on the global resource systems. These are some tough constraints for the encounter design which sadly led to the encounters being quite repetitive. The variety of the encounter difficulty cannot differ too far from the current “power” curve. Otherwise the impact on the resources might be too harsh. And the most limiting factor is that as the designer / balancer, you cannot be entirely sure what the resources the players have at a given time. A player can be in level 5 with 20 Clips and 10 Med Kits in her inventory, or she might have one 1 of each left. What do you balance the encounter for? The middle? That would be too easy for good player and way too hard for the less advanced. For the Minimum-case? Then there would be no challenge. You get the problem.. This is why shooter nowadays have auto health refill instead of health pickups. As a level/content designer, you can create more interesting fights when you know that the player enters a fight with 100% HP. You can add spots where the player can regen and then crank up the difficulty again. Knowing how many resources a player has at a given time, allows designer to create better tuned content. The designer of XCom for example want the players to focus more on the individual fights without forcing the player the consider the non-fight-systems of the game too much. Ammo is not relevant at all. The only way XCom emulates an ammo system is by limiting the number of shots until the weapon needs to be reloaded (at the opportunity cost of shooting). But the player has unlimited reloads, hence unlimited shots. This liberates the designers to put more action into the single encounters as there are no consequences for the global game-economy. 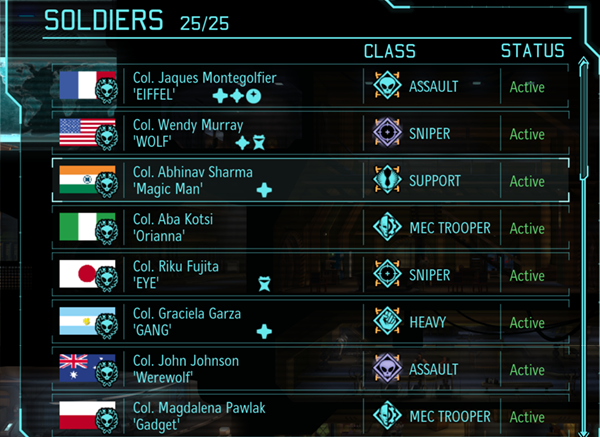 (While of course there are a couple of mechanics in xcom that make the players consider the global-consequences of their actions such as wounded-players, using explosives-destroys-weapon-fragments). Health supply is limited in-fight by the charges of the med kit (which can be increased by bringing a support class). There will be no situation in an “XCom” Encounter where the player has an unforeseeable amount of Health-Refills or Ammo. 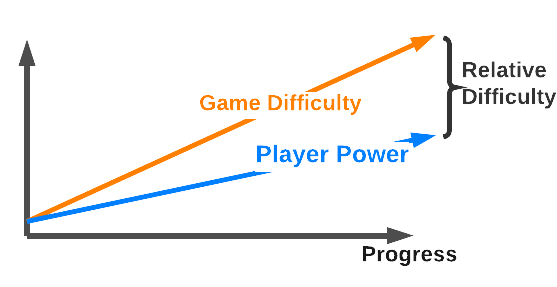 In any games with a challenge component, the games difficulty increases over time in order to keep the game interesting. To also convey the feeling of achievement and mastery, the players “power” can also improve. 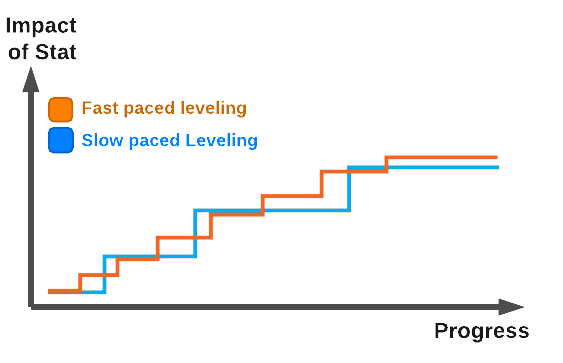 Many games utilize a leveling-system for that purpose. In Halfway there is no XP-based-leveling system that increases a units stats or adds new abilities. The only way the players power level is increased to match the increasing difficulty of levels, is by equipment (armor & weapons), and by Stim Packs. Stim packs can be found in levels and use one inventory slot. The player use the stimpack to increase the respective stat of a unit of her choice. Stim packs act as distributable stat-points (in RPG’s those are mainly given to the player when she levels and can be distributed freely in some games (e.g. Dark Souls) or increase automatically ( MMO’s ). Stim-packs are quite rare and given that the player has 5+ units every increase in a stat should have a significant impact. The frequency of stat increases determines how much impact that increase has. So there is a tradeoff between how often the player is rewarded with level-ups and how much more powerful the player becomes. To allow for tactical choices during fights, games that incorporate group-combat mechanics rely on unit-roles. From Team Fortress to Final Fantasy all the genres use a system of weaknesses, strengths, armor types, abilities and usable equipment to create distinct roles that are played in different ways. Players can then strategize on how to set up their squads to solve the fight challenge. The unit roles in “Halfway” are created by different Weapon Types whose efficiency depend on their accuracy at specific ranges (more details on weapons soon). Every unit comes with 2 abilities which somewhat determine the weapon and thereby also the role of each unit. The connection between Abilities and Roles, hence weapons, is quite loose in most cases. The “Rifle Expert”-ability cleary specifies the role & weapon, while the “Medic”-role can be legitimately played with all weapon types, whereas some weapons make more sense than others. Xcom handles this topic differently. Characters have a specific class that come with very unique abilities that cleary distinct the different roles. In combat, units have Health and Shields. When taking damage, shields will be reduced first. When the shield-hitpoints are down to zero, incoming damage will reduce the health-points. Incoming health-damage is reduced by suit-armor. When the health-points reach 0, the unit becomes unconscious and is not able to continue fight/moving. When a fight ends, shields are restored and unconscious units awake with 1 point of health. There are different suit types that have an important part of this system. The damage a unit can take, depends son its hitpoints – hitpoints = health+shields Balancing-wise armor can be translated into hitpoints – a 50% reduction of incoming damage for example is basically doubling a players hitpoints. hitpoints = health*armorMultiplier + shields This means that armor scales with health: each health-point added to a unit, is more worth with a higher armor. The value of shields does not scale with hit-points. 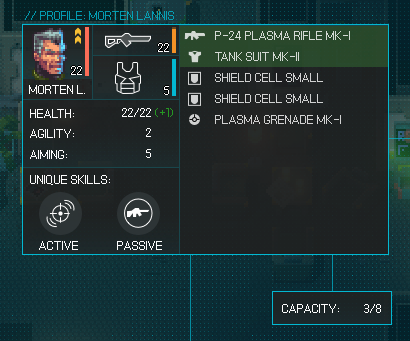 So at a certain health-threshold, a unit will benefit more from a tank suit, than from a shield suit of a specific type. At a given Equipment Tier, the suits are about equally strong in terms of total hitpoints (I estimated a certain health value on a unit for a certain Tier because hier tiers of equipment become available later in the game where units have more HP). This has been calculated with the actual configured values from the game. Luckily the developers created the game to be modable and all the balancing files are disclosed ad JSON files. I collected some of the data for suits and weapons in this excel. Download Collected Data. Shield suits come with an advantage though. Remember that shields are restored after a fight? Health points are not. The advantage of shield suits are free hit-points. Also the drain on the economy system is reduced because the player will need less medkits which are worth a certain amount of energy. This advantage does not come with another cost as far as I can tell. This would mean that shield-suits are simply better than the other types. 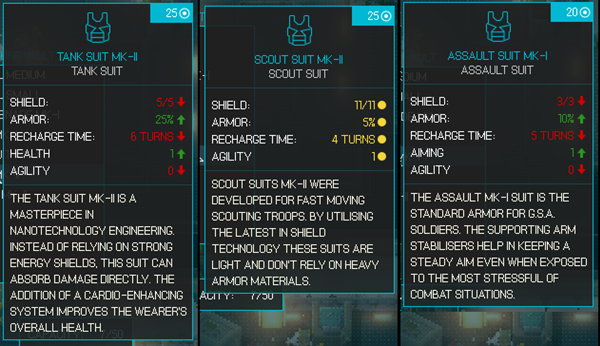 The choice for the player regarding which suit to assign to which units becomes unclear as the values between the different armor types are only slightly different. And the clear benefit what armor is better is not visible unless the player sits down and does the math. Although the balancing of the numbers makes sense as in “Cost vs. Benefits”, the distinction between the different suits is too blurry to have an interesting choice here. 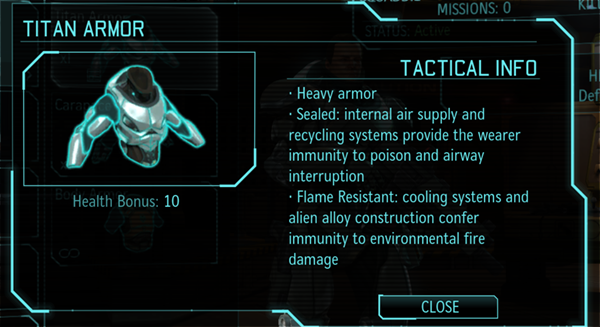 XCom is being slightly simpler in that matter too, armors merely increase the HP, but the different armor types come with special perks, such as flying-capabilities, or fire restistance. As mentioned before, weapons are the component that define the role of a unit, to be specific: the accuracy at different ranges does. An additional metric to consider when it comes to the choice of weapon is the magazine size. Ammunition is a scarce resource and therefor player want to maximize the damage per magazine. Damage per magazine = BulletsInWeapon * Accuracy * DamagePerShot. The amount of bullets per weapon and the damage are defined in the weapon and does not change. But the accuracy completely depends on the players choices (hence, the skill) during a fight. Other properties such as a weapon-damage range and critical chance that adds damage allow for some RNG to create some uncertainty which keeps the fight interesting and enables potentially exciting or threatening. 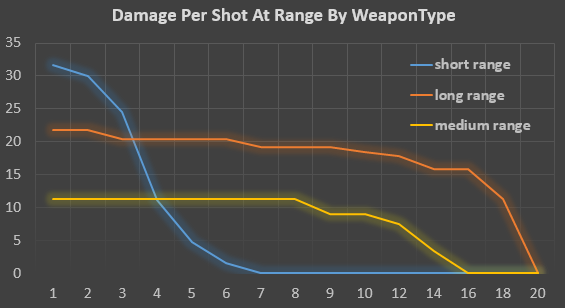 Effective Damage: Avg Damage Per Shot = (BaseDamage + CritChance*CritDamage) * Accuracy To decide what unit will receive which weapon the player must first consider the desired role-mix. Then, within each weapon type, there are multiple variations regarding the ammo consumption, damage, and accuracy. Each weapon type has a distinct accuracy-curve which ultimately defines their role. On problem with these accuracy curves is, that while in the balancing, there are quite distinct curves as you can see - ingame, nothing refers to them. It merely states the "best" range for a weapon, which does not imply a certain falloff curve. The game hides this mechanic behind the scenes. .
Short-Range Weapons are only useful when players get quite close to enemies which makes them particular good for a unit that will be pushing forward to hinder enemies from moving towards the rest of the group – off course this dynamic can only emerge because the AI is programmed in a way that it will not just run into the player group attacking a random-player unit. 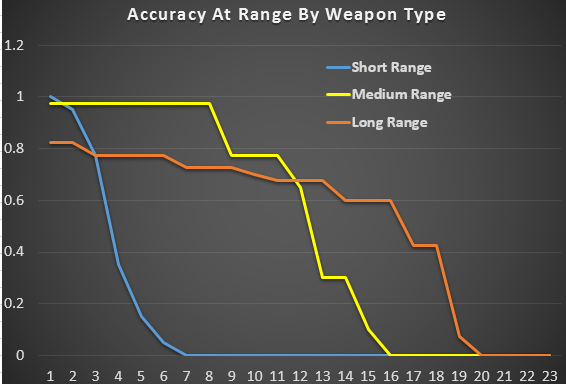 Short Range Weapons also have a smaller magazine, leading to higher Ammo-Clip cost and less shots per action-point because of an increased reload-frequency. 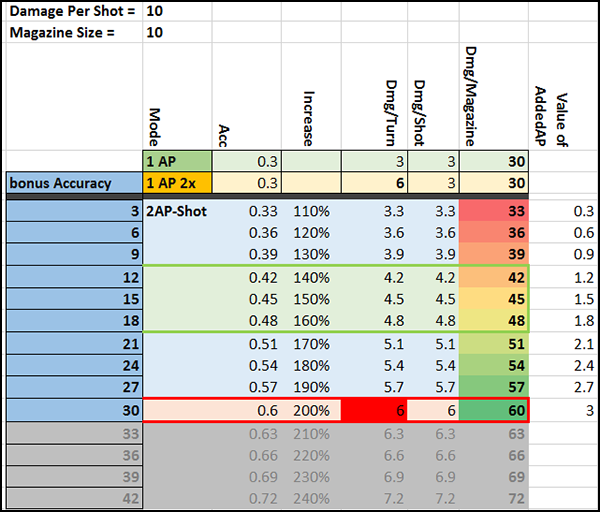 The steep accuracy falloff means that the 2-AP shot does not help the player to maximize ammo-efficiency. The accuracy is at 100% (which is the maximum) for 3 tiles and then goes very fast to 0. 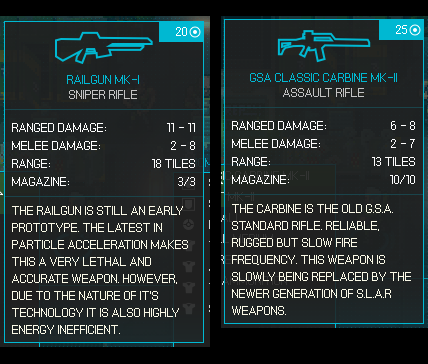 So any increase in these values will not make the weapon more accurate. The limited range is not only compensated by the high ranged DPS but also by the melee Attack which has a 100% accuracy. Since users of short-range-weapons will be closer to enemies, they will use the melee attack more often – which will also deal more damage because short-range-weapons have the highest melee-damage. Halfways balancing & design adds up when looking under the hood. How these system are entangled with each other is not clear to the player though. 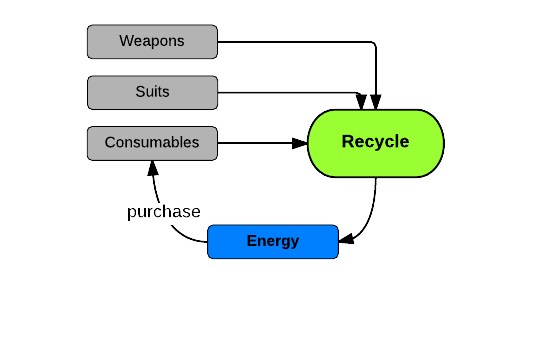 The presented choices in the unit-progression (items & weapons) are not clear enough because the connection with the unit-roles only becomes obvious when fully understanding the combat-math. Interesting choices stem from a distinct functionality and or values with a clear trade-off. The differences should be reasonably high and must be communicated explicitly in order to explain the consequences of that choice. Only a clear choice can create player-agency. The unit progression is quite slow due to the missing XP-leveling-system. This leads to a very slow progression which fits the theme. Also - each improvement is more rewarding because the impact of is more recognizable. This shows how much control the designers have when simply adjusting the power-curve. I hope you could draw something from this article.